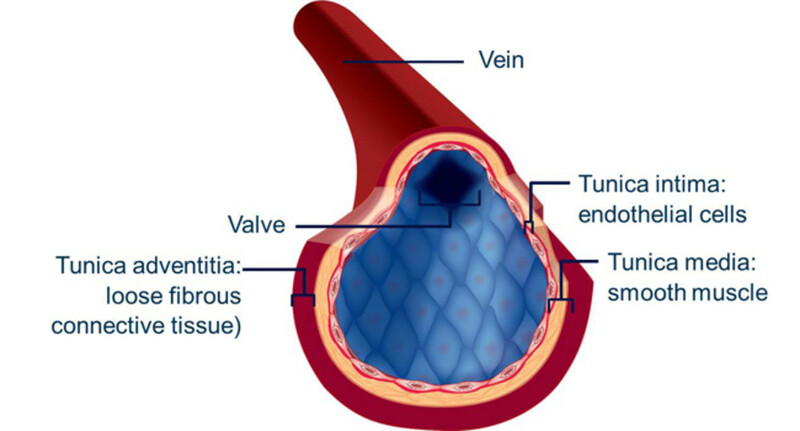 Blood vessels are hollow tubes that circulate blood throughout the body. 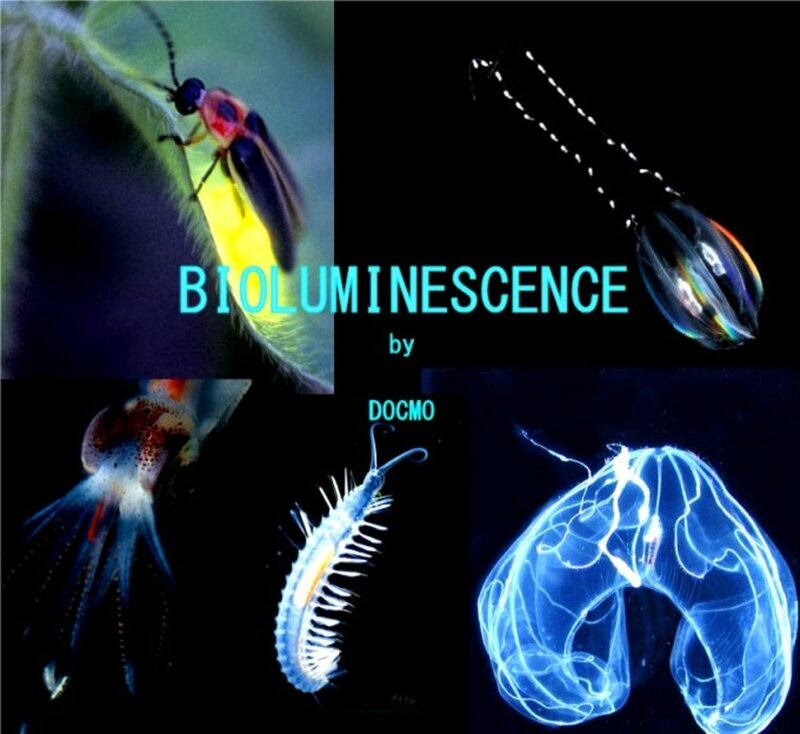 They carry oxygen, nutrients and hormones to the different parts of the body. The blood that is pumped out by the heart is circulated throughout the body. The circulated blood is then returned back to the heart. The blood vessels help in the smooth and continuous circulation of the blood throughout the body. The body has roughly around 62,000 miles of blood vessels. The length of the blood vessels when placed end to end will go around the earth two and half times. They form an important part of the circulatory system. 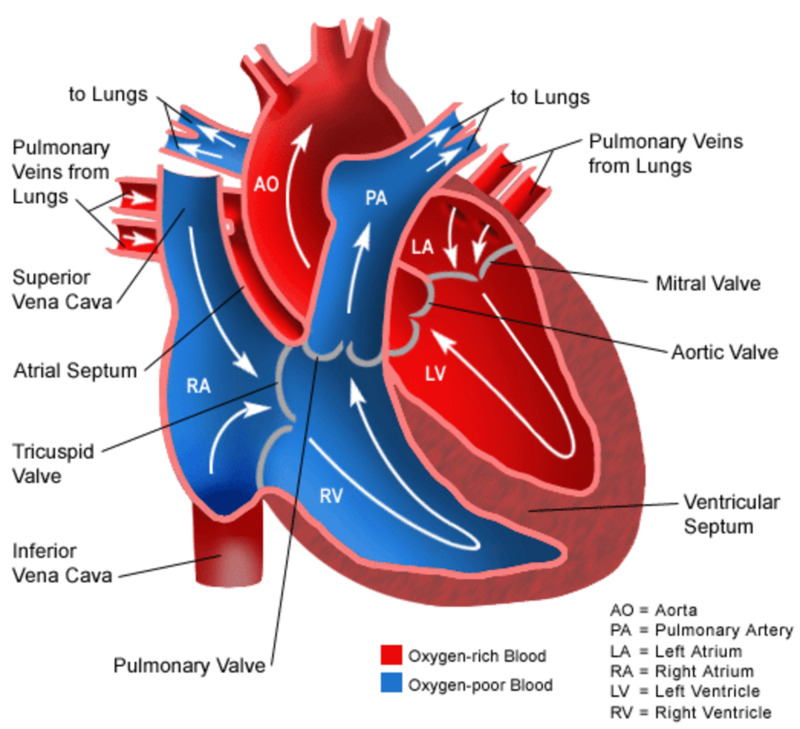 Arteries carry oxygenated blood from the hearts to different parts of the body. The arteries divide into smaller branches called arterioles and the arterioles further break up into smaller branches called capillaries. Each artery is a tube that is lined by three layers of tissues. 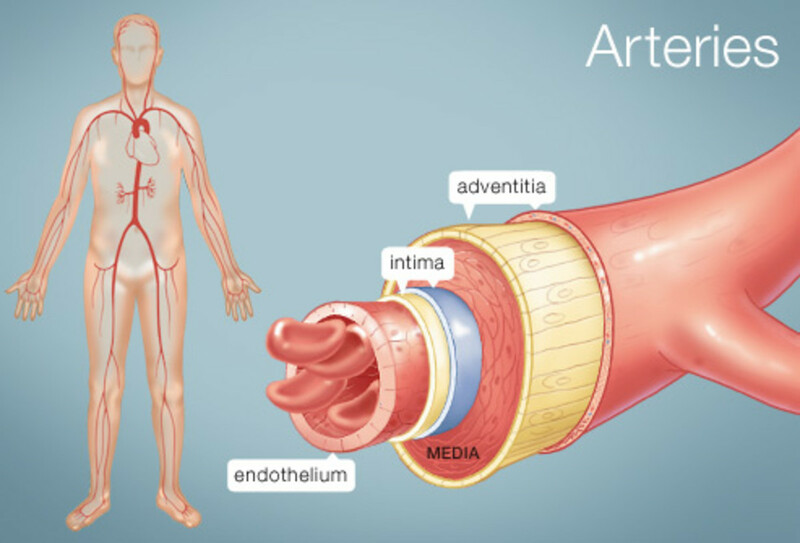 The largest artery is the aorta that originates from the left ventricle of the heart and carries oxygenated blood. The aorta further branches off into the artery, arterioles and capillaries that supply blood to the surrounding tissues. Another artery called the pulmonary artery carries deoxygenated blood from the heart to the lungs to be replenished with oxygen. All arteries carry oxygenated blood. The only exception is the pulmonary artery that carries deoxygenated blood. The pulmonary artery branches off from the right ventricle and further divides into the left and right pulmonary arteries that enter the left and the right lungs respectively. Veins are blood vessels that carry deoxygenated blood from the different parts of the body back to the heart. The deoxygenated blood appears to be a darker shade of red due to the lack of oxygen in the blood that flows through the veins. The largest vein in the body is called the vena cava. Vena cava in Latin means a hollow vein. Vena cava starts and ends with the right ventricle of the heart. Superior vena cava - the superior vena cava runs above the heart and brings back deoxygenated blood from the head, neck, chest and hands back to the heart. Inferior vena cava - the inferior vena cava runs below the heart and brings back blood from all the other parts of the body back to the heart. The difference is that the wall of the veins are not elastic in nature and are thinner when compared to the arteries. This is because the veins do not face the pressure of the blood pumped out by heart. The vein further divides into small branches called venules. 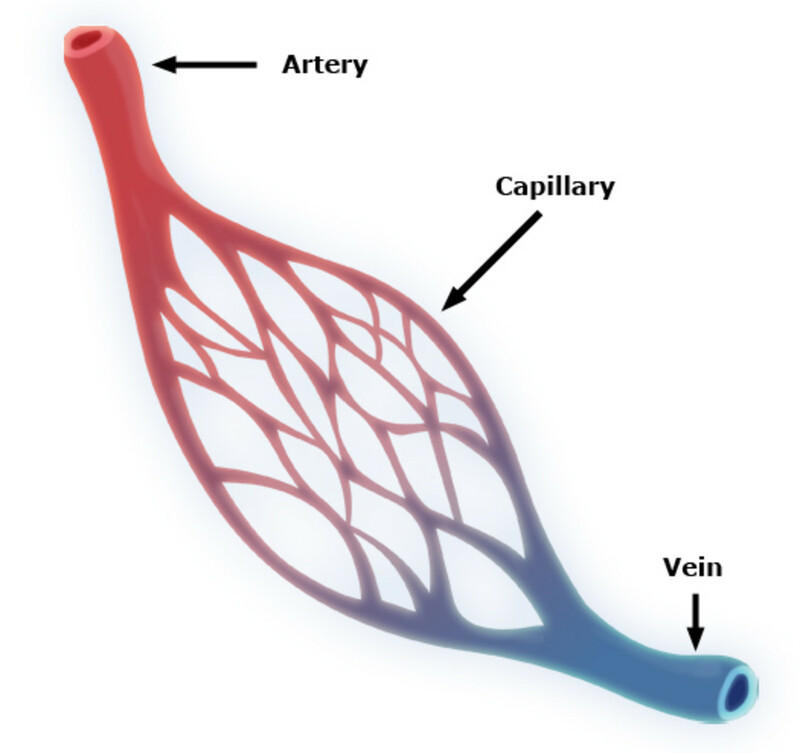 Capillaries are the smallest of all the blood vessels running through the body. They form the network between the arteries and veins. The capillaries have thin walls so that the surrounding tissues can easily absorb the oxygen and other substances from the blood. The thin wall also helps the capillaries to absorb deoxygenated blood and other waste materials from the surrounding tissues. Continuous capillaries have cells that have smooth lining without any perforations. These capillaries are tightly packed and allow only small molecules to enter and exit the cells. These capillaries are found in the central nervous system, muscles and skin. Fenestrated capillaries have tiny pores called fenestra. These capillaries allow small molecules along with a few nutrients to enter and exit. 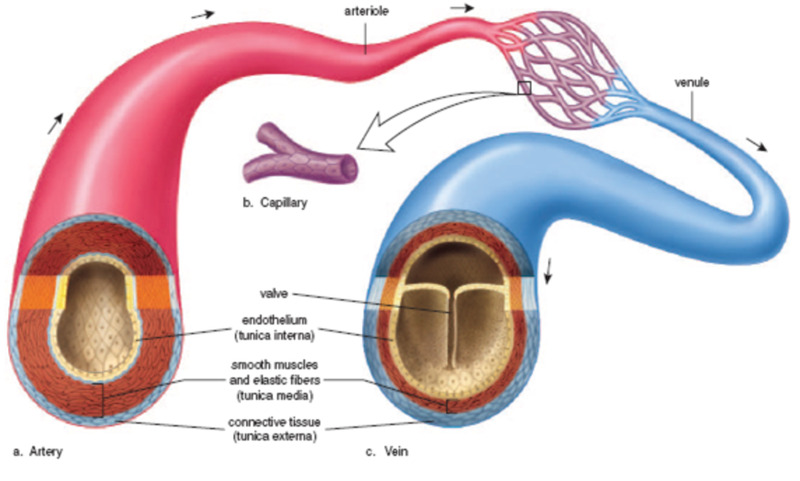 Fenestrated capillaries are found in the kidneys, pancreas and intestines. Sinusoidal capillaries do not have the regular cylindrical shape like the other capillaries. They are irregular in shape and are found in organs such as the liver, spleen, bone marrow and some parts of the endocrine system. The sinusoidal capillaries can also have perforations on their wall. Blood vessels transport blood, oxygen, hormones and other nutrients throughout the body. The blood vessels are of three different types - arteries, veins and capillaries. The artery divides into small branches called arterioles, and the veins divide into small branches called venules. The arteries carry oxygenated blood along with hormones and other nutrients to the different parts of the body. The veins carry deoxygenated blood along with waste materials from the different parts of the body back to the heart. 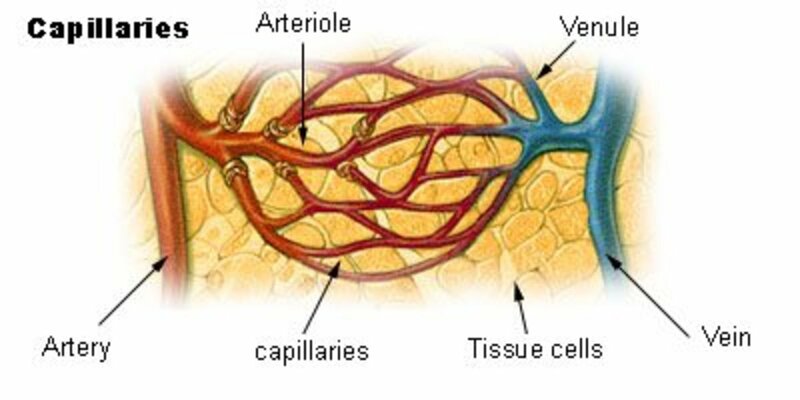 The capillaries form the network between the arteries and veins. The capillaries distribute oxygenated blood from the arterioles to the surrounding tissues. They also transfer the deoxygenated blood from the surrounding tissues into the venules so that it can be sent back to the heart through the veins. 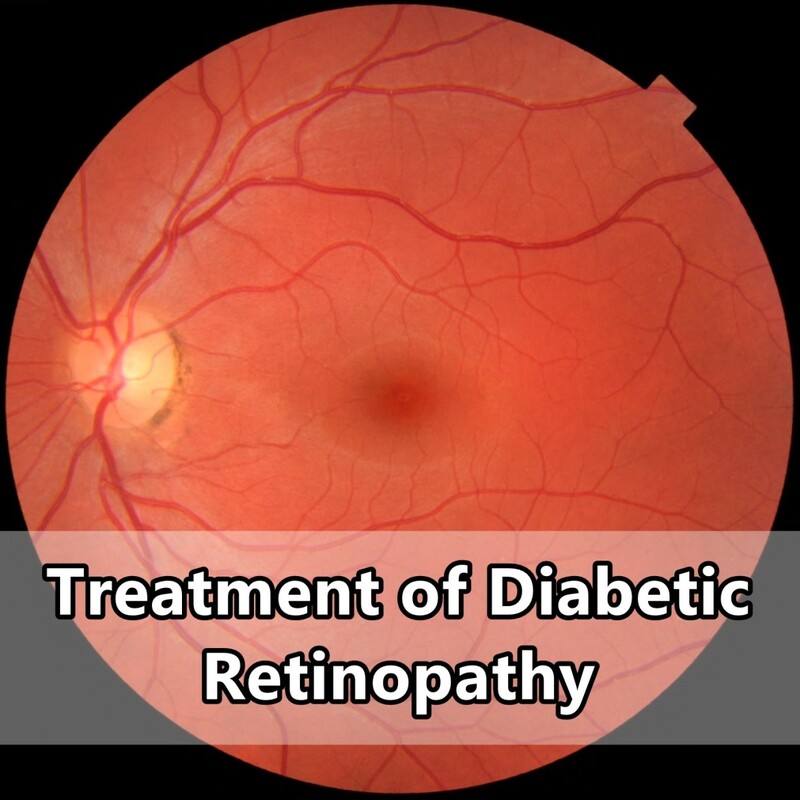 The blood vessels ensure the smooth and continuous distribution of blood throughout the body. Audrey (v0calcoach) thank you and am glad you enjoyed reading, sending good thoughts to you all the way from Dubai. What an amazing hub! I enjoy learning about my body. Knowing that my blood vessels reach 2 1/2 times around the earth just blows my mind. You've done a terrific job here. Thanks and sending good thoughts your way. AudreyHowitt thank you for the visit and share, much appreciated. Just sending this great hub around again! MartieCoetser thank you for stopping by. 62,000 miles is amazing! I remember learning this decades ago, and here I still find the facts about blood vessels fascinating. "The body has roughly around 62,000 miles of blood vessels" - This is absolutely amazing. You are so right. Thank you for your appreciation and for sharing your views with us. Much appreciated. Amazing facts. I think it is so great we are educating ourselves and learning so much about our own bodies. I think it puts many doctors on guard to have to shape up instead of trying to pass us on to other appointments time after time where it is all about money instead of doing something for us. There are some good doctors but there are many I know personally that will let you go years without even trying to help you. So hooray for learning all we can! Hooray to you for taking part in helping. suzettenaples thank you for your visit and am glad you enjoyed. Very interesting and thorough hub. I didn't realize all this information about arteries, veins and capillaries. What a great overview of the human body and I enjoyed reading this. ocfireflies thank you. I hope your dad is okay now, take care. With my dad just recently undergoing open-heart surgery-100% blockage in main right artery and 80% blockage in main left artery, I found this hub extremely fascinating and wished I could have read it prior to my dad's surgery for I know it would have been very helpful. Nice work my friend. DDE thank you for your visit and tweet, much appreciated. I Tweeted and a great read. Faith Reaper thank you, oh yes the human body is really amazing. AudreyHowitt thank you for your visit and comment. What an informative Hub! Well done!! Excellent hub here, full of a lot of useful information and well-presented too! AliciaC thank you for your visit and comments. Blood vessels form an amazing network in the body system. 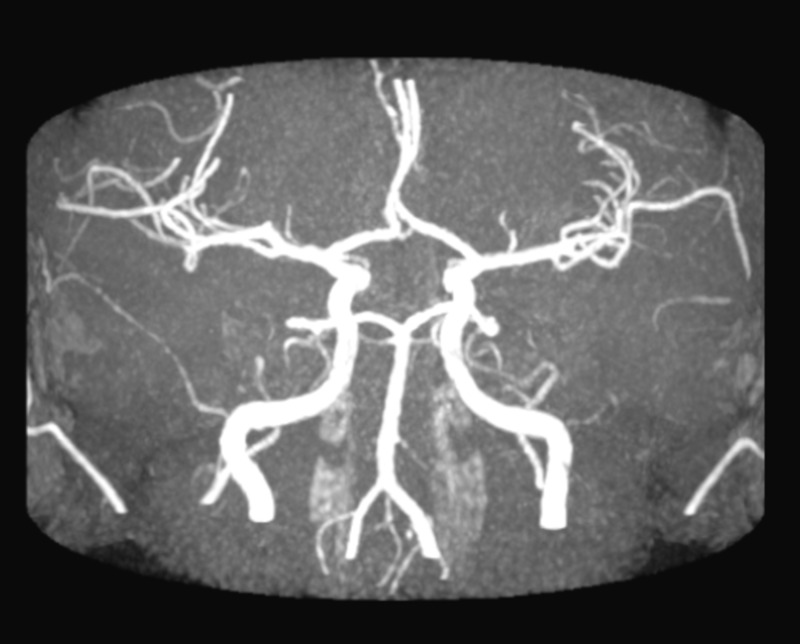 Thank you for sharing all the information about blood vessels, Vellur. This is a useful and interesting hub! annart thank you for your appreciation and lovely comments. You made my day! I was never very keen on biology and we had a very boring teacher, therefore I learnt very little in those lessons. It is an interesting subject and now I wish I knew more about it. 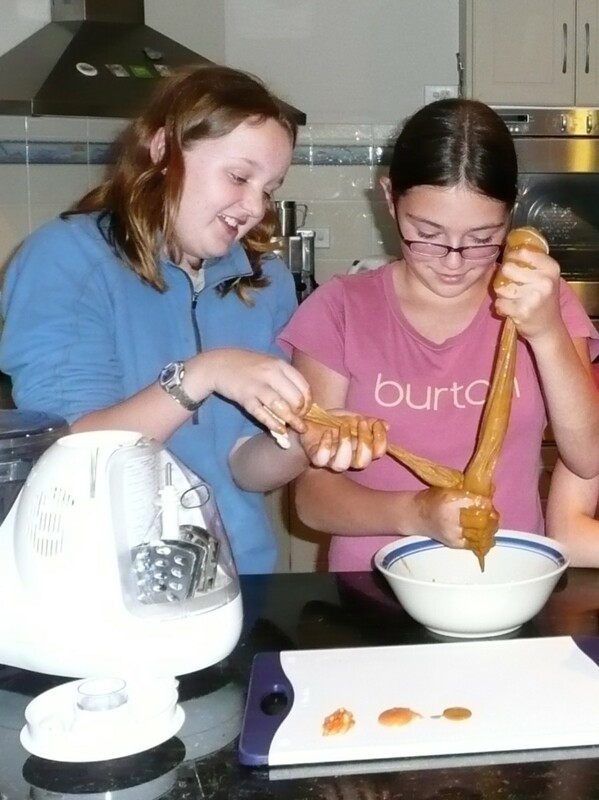 If I'd had this hub back then, I'd be fine and would've learnt so much more! Shame the teachers couldn't make it as interesting nor as informative. ChitrangadaSharan thank you for your visit and comments. Thanks for the share too, much appreciated. Very interesting and informative hub about blood vessels that all of us must know! Reminds me of my school Biology lessons. Well researched and well presented. Thank you for sharing! Sharing on HP! teaches12345 thank you for your visit and for your appreciation. 62000 miles of blood vessels? That is amazing! I have to say this was not only informative but beautifully illustrated with meaningful application. Ruchira thank you and I sure hope this post helps your son to learn. It could serve as a research material for kids trying to learn the subject. My son will be learning about it in the coming months...gotta book mark it! Jodah thank you for stopping by and am glad you found this interesting. whounwho thank you for reading and leaving a comment. billybuc thank you for reading and leaving a comment. FlourishAnyway thank you for your visit and yes there are different types of capillaries. BlossomSB thank you for reading and leaving a comment. It is always great to recollect and refresh! always exploring thank you, am so happy my hub took your back to your nurse training days! This is a very good piece on the circulatory system. You explain in detail the way blood is circulated throughout the body. I felt like I was back in anatomy in my first year of nursing training. Well done! Thanks for an interesting and informative article, with great illustrations that help our understanding. I knew a lot of this, but some was new, and it's always good to refresh our knowledge of things like this. too. Lots of excellent, useful detail here. 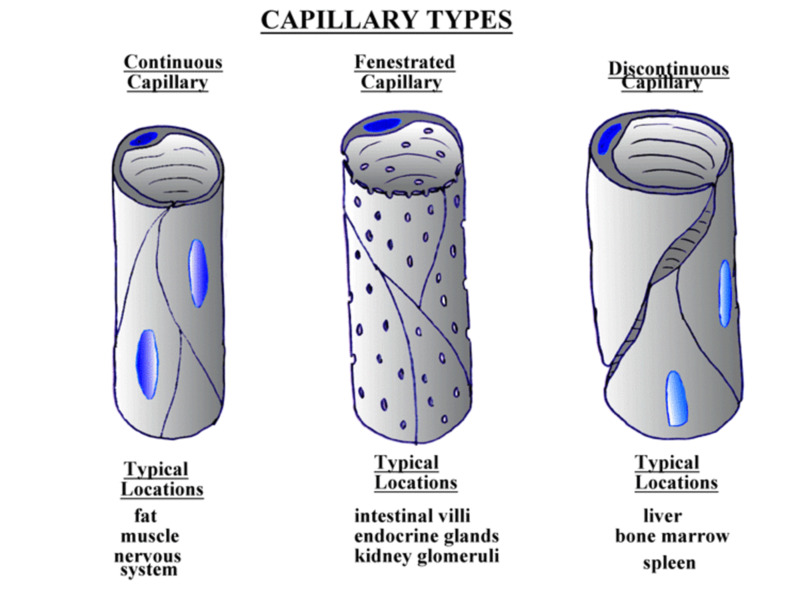 I didn't know there were different types of capillaries. Well the title didn't lie...those were very interesting facts about blood vessels. Thanks for sharing them...great informational hub. Top class hub Vellur! I knew about arteries, veins and capillaries but not all the specific details. Very thorough and interesting. Thank you for sharing.